You'll be £14.99 closer to your next £10.00 credit when you purchase The French on the Somme – From Serre to the River Somme. What's this? For many British visitors, the fighting in the Somme starts on 1 July 1916 and few consider what happened in the area before the British took over the line, part in later 1915 and some in 1916. In fact there was extensive fighting during the opening phase of he war, as both the French and Germans tried to outflank each other. Through the autumn and winter there was a struggle to hold the best tactical ground, with small scale but ferocious skirmishes from Beaumont Hamel to the Somme. The conflict in what became known as the Glory Hole, close to the well known Lochnagar Crater, was particularly prolonged. Evidence of the fighting, mainly in the form of a large mine crater field, is visible today. The underground war was not confined to la Boisselle, with a similar crater field developing on Redan Ridge; whilst south of the Somme, to be covered in a future volume, great lengths of No Man's Land were dominated by mine craters. Serre, best known to British readers for its association with the Pals Battalions on 1 July 1916, witnessed a significant, if local, French offensive in June 1915, with casualties running into the several thousands. It is a battle that has left its mark on the landscape today, with a French national cemetery and a commemorative chapel acting as memorials to the battle. The book is introduced by a chapter describing the role of the area in the Franco-Prussian War of 1870-71, a war which arguably provided the seed bed for the outbreak of war in 1914. Several battles were fought in Somme villages that were to become the victims of war all over again forty plus years later. Well researched, well written and concise this, like the other titles in the series, is an invaluable guide to the battlefield, providing not only directions and information, but historical accounts and context which sets these works apart form the mainstream. 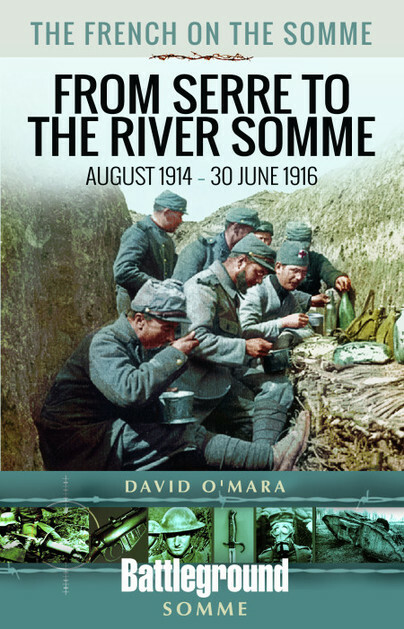 David O’Mara’s interest spans back further than he can remember, it is quite possible that his (almost) life-long study of subjects around the First World War stems from his receipt of one of the first editions of Rose Coomb’s ‘Before Endeavours Fade’ for a birthday present prior to a family holiday to the Ypres Salient in the late 1970s. This first trip to a Western Front battlefield only encouraged a vivacious hunger for more and hundreds of trips – with his parents at first, and then alone or with friends before travelling with his own family – ensued over the following decades. Over the years, David has visited the whole length of the Western Front several times over and will, hopefully, continue to do so for many years to come. Though interested in most aspects of the war, reading Blaise Cendrar’s ‘The Severed Hand’ at a young age encouraged an interest in the French side and David has specialised in this study for many years, with the main focus of his battlefield visits for the past couple of decades being to the French sectors. David originally joined Western Front Association in 1983 and became the founding member and first chairman of the East Lancashire Branch in 2008. Since 2010, he has been the official research partner for the W.F.A’s ‘Remembered: On this Day’ project.